A woman has been robbed while praying in the chapel at the QA Hospital in Cosham. 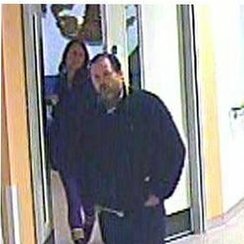 Police have issued CCTV images after money and jewellery were stolen from a woman's handbag in the chapel at Queen Alexandra Hospital, Portsmouth. It happened on Monday, November 11 between 2.15 and 2.20pm. A 64-year-old woman entered the chapel to pray. She put her bag down on a table. A man and a woman who entered the chapel shortly after were seen to remove £180 cash and a gold crucifix from the woman's handbag. PCSO David Lines said: "The rare 24 carat crucifix was on a gold chain. The pendant opens contains small pieces of wood, believed to be pieces of the original crucifix itself. This item holds extremely high sentimental value to the victim. This is a rare occurrence due to the location. There were a number of people walking past at the time of the theft." Anyone with information should contact PCSO Lines at Cosham police station on 101. Alternatively call Crimestoppers anonymously on 0800 555 111.